“Raclette” is a type of cheese, it is a semi soft cow milk cheese shaped in a 6kg wheel. Raclette cheese originated in the French speaking part of the Alpine area in the Valais Canton. If you believe the legend, it was discovered by local farmers who had set camp in the valley for the night and left some of the cheeses on stones near the fire. The cheese of course melted and some farmer scraped it of the rock to not waste any and he thought it was delicious. It quickly became a tradition amongst farmers in the region and the cheese became known for its melting abilities. It is a simple concept and the heartiness of the melted cheese on the potatoes makes it the ideal comfort. It is loved by many in France, Switzerland and Germany. Traditionally it is a dish that includes melted cheese, boiled potatoes, cornichons, mustards, pickles and a plater of charcuterie such as prosciutto, ham of the bone and salami. If you want to find the perfect wine to match your raclette i suggest you visit www.airoldifinewines.com.au . 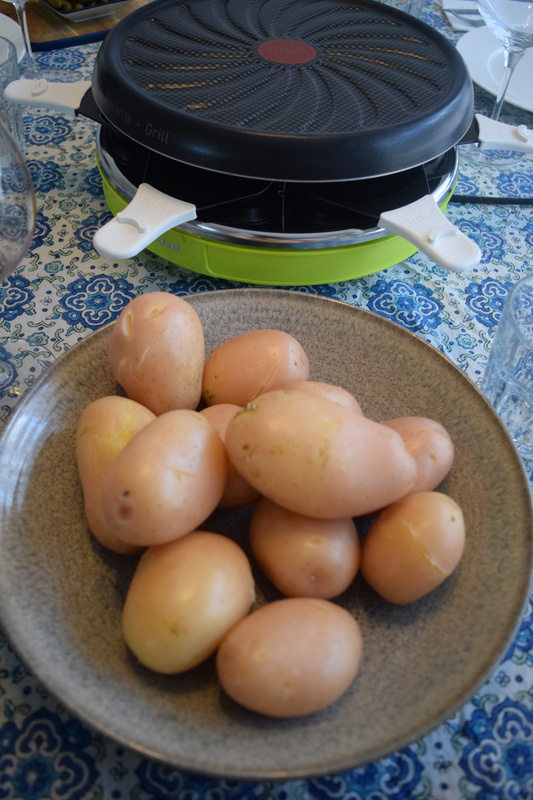 For my Raclette i use a “Tefal” raclette grill that you can find on amazon, or you can also melt the cheese over the potatoes in a hot oven. To give you an idea of how much you need to prepare, for 6 people i cooked 12 medium size potatoes and bought 3 slices of each meat ( hot salami, mild salami, ham of the bone and Australian prosciutto). I also put together a platter with Dijon mustard, Grain mustard and Cornichons and served a green salad from my garden! Terrines are always a great addition to the table, because there are so many different type and flavours. You can do one with vegetables, meat, fish, cheese or even ice cream! Terrines have been around for a long time but I think they are still popular with the foodies. Today I’ve decided to show how to do a delicious salmon terrine with a beetroot and mustard seeds relish. It’s an easy recipe that can be done the day before and save you a little bit of time on Christmas day! Preheat the oven at 180 degrees Celsius and boil the kettle. Blitz the carrot and onion in a food processor until it is quiet fine. Then heat up frying pan with a little bit of oil and cook the carrot and onion on medium heat until it soften a little bit, keep aside. Blitz the parsley and dill until finely chopped, then add both the white fish and salmon and mix until smooth. Add the eggs, the onion and carrot and slowly add the water until you have a smooth consistency. Season with salt, pepper and the chili. Transfer the mix into a terrine, put the lid on or cover with foil and cook in the bain-marie in the oven for 50-60 minutes. Once the terrine is cooked, place it in the fridge to cool down completely. Heat up a sauce pan with a little olive oil, add the onion and mustard seeds, and cook until the onion soften. Peel and grate the beetroot in the food processor, add it to the onion. Add the sugar, vinegar and a little bit of water, then cook on medium heat for about 1 hour, stirring from time to time. Christmas is a magical time of the year. It’s a time when families come together and take the time to sit around the table and share good food, good wine and good memories. And yes, if you’re lucky, a few presents as well! The recipe that I am sharing with you today is my take on “Canard à l’Orange” (Duck in Orange Sauce). 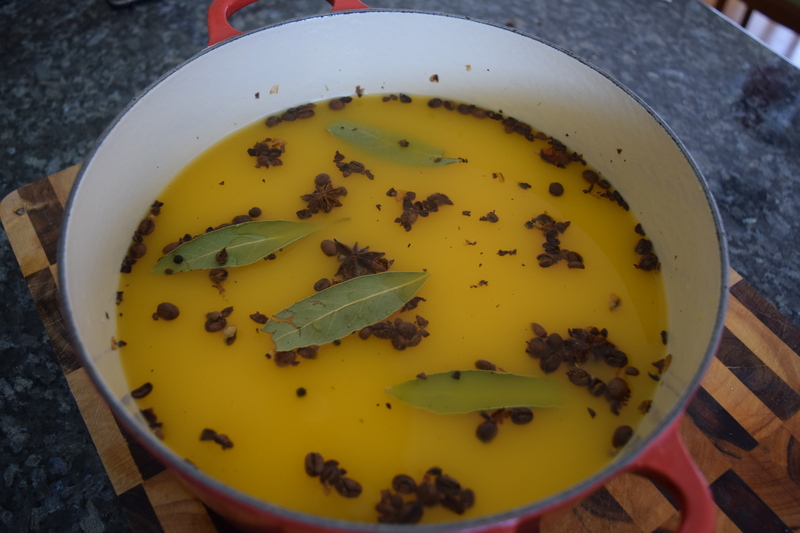 I’ve soaked the duck in brine made with orange juice, crushed coffee beans, lime, bay leaves, star anise, peppercorns and water. This process means all those amazing flavours permeate the meat all the way through, and because of the sugar content in the orange juice, the skin will caramelize as it roasts. Bring the orange juice, coffee beans, bay leaves, star anise, peppercorn and water to the boil. Allow to cool completely, add the lime, and poor the brine in a non reactive container. Place the whole duck in the brine and Refrigerate for 3-4 hours. In the mean time preheat the oven at 200 degrees. Remove the duck from the brine and pat dry. Place it in a roasting tray and cook for 2 hours. The skin will slowly caramelized giving it a delicious golden colour. Reduce some of the cooking liquid, about 400ml, by half. Then, reduce the heat and whisk in about 100g of butter. Season to taste. You can also thicken the sauce with a little bit of corn flour if you like it a bit thicker. If using dried beans, soak them in cold water overnight. Place the beans in deep cooking pot and submerge with cold water, make sure to put enough water as the beans will soak up the water while cooking. Cook until just tender, you want the beans to remain a little bit firm. Strain the beans, but keep about ¼ of the cooking liquid. Sautee the onion, garlic, pancetta and sage in a casserole pan for about 5 minutes. Add the beans and a little bit of the cooking liquid, just enough to make the beans saucy and simmer for a further 5 minutes. One of the joint culinary loves of Australians and Frenchmen alike is that of the sausage. The humble sausage is deeply entrenched in the food culture of each nation, whether is be as the quintessential BBQ food Down Under or as the staple at every French country table. But while snags are often relegated to summer dinners and hardware store parking lots here, the French relationship with the sausage is closer to one of hero worship. That’s not to say you can’t find excellent, quality sausages in Aussie butchers, but back in France there’s just so much history and variety in grind of meat, herbs, and sizes. Most regions have their own specialty, like so many foods in France, and today I’m showing you a personal favourite. It’s the Toulouse sausage (named after the town). It’s a pork sausage characterized by a courser grind, usually prepared in a long string and presented as a coil. They are also the sausage that is used to make the perfect Cassoulet. Soak the casings in warm water for ½ hour before using. Put the meat through a the meat mincer equipped with the coarse grid. Then add the white wine, cognac, salt, pepper and the spices. Mix well, cover with cling film and place in the fridge for a couple of hours to marinate the mince. Once rested, mix well and put the meat in the sausage skin using the sausage attachment on your mincer. Don’t go too fast as you need to make sure the meat is compressed enough in the skin, so there is no air pocket and also that they are the right size. Hang the sausage in a cool dry place and they are ready to use the next day or alternatively you can also freeze them! Tips: You can make individual sausages by pinching and twisting the sausage, the size is up to you. Personally I prefer to cook whole so it stays juicier and it’s also better for sharing. Serving suggestion: I served my Toulouse sausage with a Rocket, Packam pear, Roquefort and walnut salad dressed with a raspberry vinegar dressing. In the fifteenth century the Gascon-born French King, Louis IV, famously said in his coronation speech something along the lines of, “I want every peasant to have a chicken in their pot on Sundays”. Well, far be it from me to deny the wishes of an ex-sovereign, so today, I bring you this simple recipe that’s perfect for feeding the family, Sunday or otherwise. Just like the pot-au-feu recipe I’ve shared previously, you can use the broth from the pot that remains at the end of cooking as an entrée and then serve the meat and veggies for the main. What really brings this dish to life though is the sauce gribiche. The capers and cornichons give it a tang that complements the chicken so well! Put the chicken stock, slices of bacon, vegetables, garlic, peppercorns and bay leaves into a large pot, bring to the boil and leave to simmer while you prepare the stuffing for the chicken. Mix the chicken liver, breadcrumbs, bacon, garlic, shallots, parsley, eggs and salt together in a bowl. Season the inside of the chicken and spoon the mixture inside. Truss the chicken securely with cooking string. Add the chicken to the pot, making sure that it is submerged. Add I teaspoon of salt, bring back to the boil and cook for 30 minutes. Turn the chicken over top up with boiling water if necessary, but don’t dilute it too much and cook for a further 10 minutes. Meanwhile preheat the oven at 150 degrees Celsius. Place the slices of bread onto a tray and leave them for 20 minutes to dry out in the oven, but not brown. Lift the chicken out of the pot, remove the first lot of vegetables and discard. Return the chicken to the pot, add all the vegetables and bring back to the boil, and simmer for 10 minutes and then the vegetables and chicken should be cooked. Whisk the mustard and vinegar together in a small bowl, then gradually whisk in the olive oil. Stir in the caper, cornichons, egg white, egg yolk, parsley and some salt and pepper to taste. To serve lift the chicken onto a board a cover with foil. 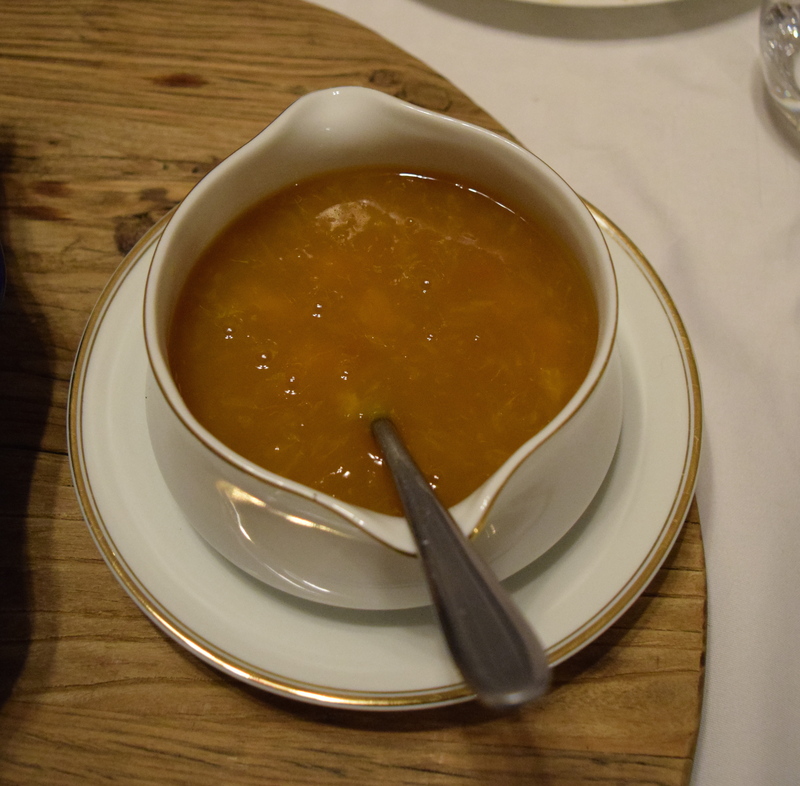 Put the dried slice of bread at the bottom of a soup bowl, cover with stock and eat as a first course. Carve the chicken and cut the bacon. Place some vegetables, chicken, bacon and stuffing on a plate. Drizzle with some stock and serve with the sauce Gribiche. Despite the more colourful inferences that pasta alla puttanesca was born of Italian houses of ill repute, made by prostitutes to lure customers in from the streets, the dish in truth, has far more simple beginnings. Yes, it’s true that “alla puttanesca” can translate to “style of the whores” but the very similar word “puttanata” means rubbish, or crap, and its in this translation where we find a more probable history. In the 1950’s, on the island of Ischia, a man by the name of Sandro Petti was asked late one night by some patrons in his restaurant to make them some food. Nearing closing, he didn’t have many ingredients left so told them there wasn’t enough to make a meal. “Facci una puttanata qualsiasi,” they said or “Make any kind of garbage”. Only having a few olives, tomatoes and capers, he used these to make a sauce and mixed it with spaghetti. Petti later placed it on his menu, but changed “puttanata” to “puttanesca” apparently because the former didn’t sound quite right. Bring a large pot of salted water to the boil and cook the pasta for about 4 minutes or until al dente. Meanwhile place a large frying pan over medium-high heat. Add olive oil, then add the garlic, anchovy and chili. Add the pitted olive and cook for 2-3 minutes or until the garlic starts to slightly caramelize and the anchovies start to blend into the sauce. Add the cherry tomatoes and a little bit of the cooking water, cover with the lid and cook for 2 minutes or until the tomatoes start to cook. Add the basil to the sauce along with the fresh pasta and some of the cooking water, just enough to loosen and make delicious and saucy! Taste and adjust the seasoning if needed, transfer the pasta in a big serving bowl, top with shaved parmesan, basil and anchovy fillets. A glass of EVOI Sauvignon Blanc Semillon From www.airoldifinewines.com.au would be a perfect match with this delicious pasta dish.